Are you stressed over the cost of your wedding? Do you wish someone else would just pick up the bill? We all know that weddings are expensive, but it hurts more when you’re the one writing the checks. The average cost of a wedding in the US is close to $30,000! Crazy, right? In order to pay for this, many couples either take on debt, save like crazy to pay for a dream wedding, or cut costs by restricting the number of guests and going DIY on the whole thing. There are a huge number of companies out there who think outside of the box and are looking for interesting, appealing new ways to promote their brand. The days of plugging a brand name on a poster in a dark alley are long over. Larger and small businesses alike are commonly expressing an interest in finding clever means of marketing. Wedding sponsorship is one such way. Rather than pay for their wedding, some couples are opting to get some or the whole thing sponsored by businesses and brands. This may seem like a crazy idea, but the trend for sponsored weddings is growing. I explain in a ton of detail how to get your wedding sponsored in my 24 page guide, but I can tell you in a nutshell, the first thing you need to do is create an image/brand for yourself. After all, this is serious business! Well first you’ll need to create a blog. A blog is going to show potential sponsors your story and help them learn more about you as a couple. This is how they can decide if they want to help pay for a part of your wedding. As you collect sponsors for your wedding, you can publish new blog posts thanking them and telling your friends and family about their company. If you’re worried about starting a blog, it’s actually really easy. Here is my tutorial, which is the easiest way to set up a blog without hiring anyone, and it will only take you about 30 minutes to complete. Why Would Someone Want To Sponsor Your Wedding? You might be wondering why a business would even be interested in sponsoring a wedding. However, as someone who works in digital media every day, I can tell you that companies are looking for unique ways to market their products and services. People are bored with traditional marketing like TV commercials and radio ads. Companies love working with young people, especially those that have a heartwarming story to tell like a new couple. You can make a list of potential companies on your own and start pursuing relationships with companies, but if you’re a little unsure, I included a step by step process on how to get sponsors in my e-book. I even included a sample phone conversation you can have with a potential sponsor to help seal the deal. There is also a list full of custom packages you can offer sponsors and some ideas on what parts of your wedding you can sponsor. I’ll also explain why targeting a new business might be a good idea. 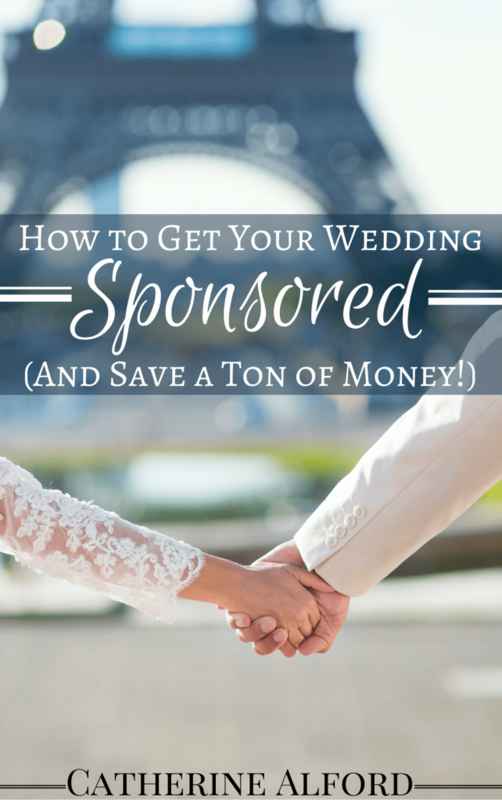 Just like any other sponsorship arrangement, businesses that sponsor a wedding want to know that they will get a good return on their dollar. Remember that the sponsorship arrangement needs to benefit both you and the sponsor for it to work. It really helps if you already have a strong social media following on Facebook or Twitter because you can show a sponsor that you can reach thousands of people. However, if you don’t have a big following you will be surprised how quickly you can gain followers if you put your effort into it. Again, having a blog also shows sponsors that you are very serious when it comes to having sponsors for your wedding. You should also find a way to make your wedding unique in some way. Do you have an interesting story about how you got together? What about any difficulties that you have had to overcome in your lives or relationship? Can you get married in a unique location or incorporate an interesting theme? Local newspapers and local television stations LOVE covering this sort of thing, and you can use this potential media exposure get sponsors, contact producers, and more. Overall, getting sponsors for a wedding is a lot of work and it takes confidence, persistence, and a lot of effort. It is not something that happens overnight, but it is very possible. So, if you are motivated to get your wedding paid for by companies, you CAN make this work. Just make sure that your desire for a free wedding doesn’t overshadow the point of the whole day. Be genuine, sweet, honest, and just you, and you may just surprise yourself at how enterprising you can be when planning your special day. To learn more about my e-book and the topics covered, I have included information on every chapter and what you will learn below. Good luck and congratulations on your engagement! I would’ve been way to shy to consider anything like this but I don’t see anything wrong with it. To each their own! It would have been hard for me too but I think it’s genius for someone who has the type of personality to really go for it! Haha Stefanie, you’ve definitely got the hardest part out of the way 😉 But I agree, if the reality shows do it, why not do it in real life? I have actually been thinking about this. Some vendors have already contacted me and all they want in return is to be included in a recap of my overall wedding in a blog post. Luckily these are all companies that I would have used, so it makes it super easy! Hey Michelle, it’s great that business are already approaching you. The hardest part would be finding businesses that understand the benefits that sponsorship can bring. And if they are business you would use anyway and it fits in with your wedding then you should go for it. I need to upload an ebook I have soon. That sounds awesome! I wonder if I have what it takes to make mine happen too. Do you have some tips you can share besides what we read here? Great Day. Great feedback. My wedding is Dec.3rd. My goal is to get 10k in sponsorship if not more which is light but would give me and my lady some breathing room. We have minimal support from family outside of a few things and open to any wisdom. This is an interesting idea. If and when I get married, I don’t think I would consider it only because I plan to have a very small wedding. I’m talking less than 50 guests, as I don’t want it to be too chaotic. I’m sure vendors would want a bigger turnout, but it’s a neat way to lower wedding expenses while still having the things you want. Hi E.M. I wouldn’t discount the idea of sponsorship just because you are having a small wedding. If you can get exposure beyond the immediate wedding guests (ie, through a blog or media exposure) then that could be just as valuable to a sponsor. I’ve heard of people doing this although I haven’t attended any wedding with sponsors yet. I think as long as it is tastefully done and doesn’t overshadow your actual wedding, than why not give it a try. I would definitely have a blog where they can even do featured articles – showing how to arrange flowers, etc. Exactly – and if you can give them exposure beyond the wedding itself, then it’s a very cost effective form of marketing for them. I love, love, love this idea. It’s a really ingenious way to tap the value of your wedding without having to rely on your existing income or gifts of funds from family. Thanks Done by Forty. When I first came up with the idea for this article, I thought the idea of a sponsored wedding was a bit crazy. But the more I think about it, the more it makes sense to use sponsorship to offset the cost of a wedding. Great idea! A bit of subtle advertising could really help with the costs of a wedding. Wish I had thought to look into this for my wedding! Thanks. The idea of getting sponsorship for my wedding (when that happens) is growing on me. I think it could be subtle and still effective. I’ve heard about sponsored weddings but I’m not sure if it’s something I would even consider. Although it may work for others. Do you know anyone personally who had a sponsored wedding? Hi Marisa, I don’t know anyone personally that has had sponsorship at their wedding, but I’ve definitely seen that it’s gaining more prominence. I think the trend actually started in the UK, and then has become popular in the US. I actually think that it could be a great way to offset the cost of the wedding if you do it in a classy, and not intrusive, way. This is a great idea! I saw a website a couple of months ago by a couple who is trying to get their whole wedding sponsored. Not sure if I could have the whole wedding sponsored, but I wouldn’t mind having some elements sponsored at my own wedding. I agree Lisa that it’s probably easier to have elements of the wedding sponsored, rather than the whole thing. But there have certainly been couples that have managed to have the whole thing sponsored. One couple in the UK had a Pounds 20k wedding sponsored in full! “When every guest is forced to wear a Tom’s Plumbing baseball cap and the bridesmaids dresses are Wendy’s aprons, then you’ve probably gone too far.” HIlarious! My wife and I did not go this route when we got married two years ago, but I definitely was aware that the option was out there. Thanks DC, glad to you liked it! 1. go to get the paperwork done (the townhall or something similar). This is the mandatory part, since you have an official give you the OK and you also get the wedding certificate from there. You need two witnesses and you can cal friends and family. The entire process is 5-10 minutes and you are officially married after this. 2. the white wedding, church and the big party. Some couples (us included), decide NOT to go this route. We’re not usually going to church ourselves and honestly we have better things to do with the money (especially since we’re expecting our child and there’s always money to be saved. So we skipped this part. We went just for the ‘civilian’ part, dressed nice (not in a wedding dress, just some nice clothing), had around 40 people with us (close friends/family) and almost 30 came with us at a nearby restaurant, where we served them lunch and chatted. It all lasted about 4 hours, it cost us little (around 600 bucks) and we had a GREAT TIME. I don’t feel ‘robbed’ of my big day, it was amazing to just say ‘yes’ and have the people who mean the most in our lives share the moment. We didn’t break the bank and can get ready for when our child comes. As a mother to be I consider that my wedding day will not be the best in my life (we’ve been actually together for 11 years), probably when our daughter will arrive that will be our best day. Or.. who knows what the future will bring us. Anyway … sponsoring a wedding can be a good idea. If you still consider the entire process to be mandatory and cannot live without, instead of getting into serious debt or messing up your savings just for a day (no matter how special), this might actually work nicely. I would accept this ‘compromise’ to be honest, if it meant us starting our life together in a better financial position and still getting ‘our big day’. I would definitely try out this method! Especially for something as costly as a wedding! Wow, My partner and I have been talking about getting married for two years now. Each time the subject comes up we both just hang our heads at the ridiculous cost that we would rather put into our mortgage. This idea is brilliant though and if anyone comes up with a “how to” for a sponsored wedding I really want to hear about it. It does lead me to think about whether I should start a wedding blog or even incorporate it into my current money blog? Thoughts anyone? It is all about saving money after all! Maybe after we have had our second child ( in the planning process) I will consider this more seriously but thanks so much for the idea its definitely worth exploring. To be quite honest if it meant wearing a plumbing hat for a few worth of wedding stuff I would probably do it haha. At least your photos would be original! I know this post is old, but I would like to know how would you recommend a person find out the newer companies from the more established ones? A friend of mine who also works in the industry just received a sponsorship email from a soon to be wedded couple. He wasn’t their source for their wedding bands or engagement ring(s). They just asked him out of the blue if he’d provide the bride with jewelry to wear at the wedding. Let me put it nicely: This is insulting. Don’t, just don’t. The same goes for any other artistic endeavor. We work hard to create this jewelry, and if you like it and want to wear it at your wedding, RESPECT US enough to buy it from us. You and I both know that any “exposure” you give us isn’t worth the paper it’s printed on. The idea of having a sponsored wedding came to me in the shower this morning. At first I was like noooo, but then the idea seemed to grow bigger and I was lost in my mind trying to figure it out. This would be great for me and my fiance since we are both young college students and my fiance is on dialysis. We tried to have a small wedding, but me and my fiance have a big CLOSE family and a wonderful church family who all cant wait until our big day. Where would I even start to look? Who would/should I consider contacting? Im getting ready to start vlogging soon on youtube, but until that what should I start doing? My fiancé wants to get married in a sleeveless camo tux. This is his first marriage and the second for me. I got married at the court house. So never having a real wedding, I would love to be able to have a few of my little girl wedding dreams come true. Any suggestions on finding a sponser for my semi-formal redneck wedding?! I would definitely try out some of the tips in the article but target camo companies etc. Think outside the box! Good luck! Me and my fiance is needing help with our wedding. How can we get this started up and moving? I have an ebook coming out soon! Aww I wish I can find sponsors as well! Me and my partner need some help! We wanted to get married we already have 4 kids and we just can’t save $$ for church wedding! Well I only planned for simple wedding but it’s only a plan it’s not gonna happen because it’s just expensive.. 🙁 too bad for us! And I find this article interesting ugh is there any0ne who’s willing to help what should we do to get sponsors? What website I am going to make? And what we can do for sponsors in return? Aloha! My name is Sandy and my fiance’ and I were born and raised in beautiful Hawaii. We have two wonderful and active toddler little boys. We are getting married this year Father’s Day. We reside in Las Vegas which is also known as the Hawaiian 9th Island due to alot of people from Hawaii relocating their families here due to the cost of living and career market. So far everything has fallen into place except for the cost of flowers and our reception dinner for our guests of 40-70 people. The idea of getting our reception dinner sounds awesome, I just don’t know where to start. We are getting married at a local wedding chapel whom I realized that I knew the owners and whom has given us an awesome deal. Our reception dinner we have chosen to go with a family members Hawaiian Resturant located in the Southwest part of the Valley. We are excited and a little stressing…. This is a good idea. Me and my fiance are based in Uganda- East Africa. We are planning to get married in September this year, we are Christians and want to go through the right procedures to get married. However, we are struggling to make our dream a reality. Any advice or help will be highly appreciated. Im currently trying to figure out how to get sponsors in my area (Hamilton, Ontario, Canada) and am having no such luck 🙁 if anyone has any advice it would be much appreciated! Hello! I need a lot of help for my sister’s wedding. All of us (siblings) are abroad and can’t afford going back home to the Philippines to be there on her wedding day. What I only ask is to help her financially to make her wedding a memorable one. She almost paid for everything but not the photographer and videographer. You all know that this only happens once in a lifetime and she wants to treasure this very special moment by hiring a videographer and photographer but she can’t afford. This is the only way I can help her, and present this as my gift on her wedding day, even if we won’t be there. Thank you so much for your help. I don’t have nothing but in return, I assure you of my continued prayers for your health and happy future! Well what a great way of helping people. This looks possible in the west but not here in the south (Africa). I have taken time to read what people have written, it’s inspiring big time. I’m in need of a sponsor or sponsors for my wedding which is coming up six months from now. But I don’t know how to go about the whole process of getting sponsors on board. please help. Holy cow! Maybe I’ll make Pat re-marry me in the Church and we’ll do this! Haha with your following you def could! It’s a nice way to save on wedding expenses. I am not yet married, but I am planning to up a blog so that by the time that comes, there’s a high possibility of our wedding being sponsored. Yay! Thanks for the ideas. My fiance and I have been together for almost 4 years and now the time has come to take the next step in our relationship and get married. The only problem we have is that we can’t afford to pay for our wedding. Incredible story – Good luck finding a way to get your wedding sponsored! My fiance and met eachother back in May 2017. We had a crush on eachother when we were 13 years old, but were afraid to tell. Our love is so pure, and I’m glad to have him in my life. He’s all I ever wanted in my life! My bestfriend, man, brother and father. But it hurts sometimes to see him suffer for saving money for our wedding. With this opportunity it can be very helpful. We live in Belgium. He’s belgian and I have moroccan roots. And we love to have an arab style of wedding. It can be challenge/experience for the sponsors. Thanks for reading and hopefully waiting for a response. Hi Sara – It sounds like you have a unique heritage. I recommend you download the ebook to learn how to get your wedding sponsored! Aw that’s a great story! I love it – hope you get your dream wedding someday! Michelle Norvell I know the feeling. My partner/love of my life and I met 30 years ago. We have 3 amazing sons (18,24,26). I had an accident last year and I am here by a miracle of GOD. My partner and I decided that it was time to get married. We struggled most of our lives raising our children and trying to provide the best that we could for them. Now that they are grown, we are getting married in October 5, 2019. I started planning my “simple” wedding in the backyard of my future sister-in law’s house with about 30 people. Now that the word is out, everybody wants to attend. Now we are up to 80 people and we had to rent a hall. From something simple, it went to more of a formal wedding and so did the cost. I am a little nervous since the cost is so much higher. I love the idea of doing a blog but I don’t know if I would be able to get sponsors. We are an older couple and not just starting our lives.